Where oh where has my plastic all gone? 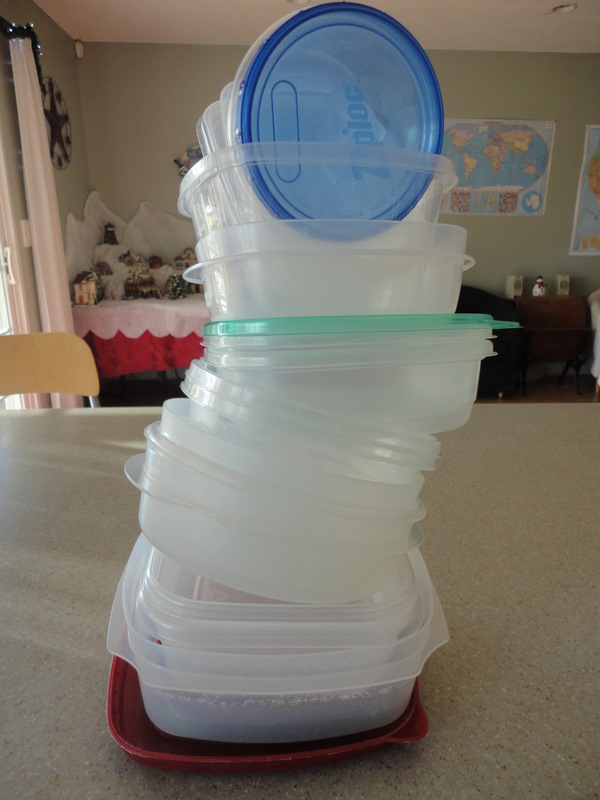 Right before Thanksgiving I had to buy a few sets of “plastic storage containers” so I would have a place to store all of the leftovers, and some containers to send goodies home with family. Right before I went shopping for the new containers I checked my “Tupperware” cabinet (does anyone buy just plain old Tupperware anymore? 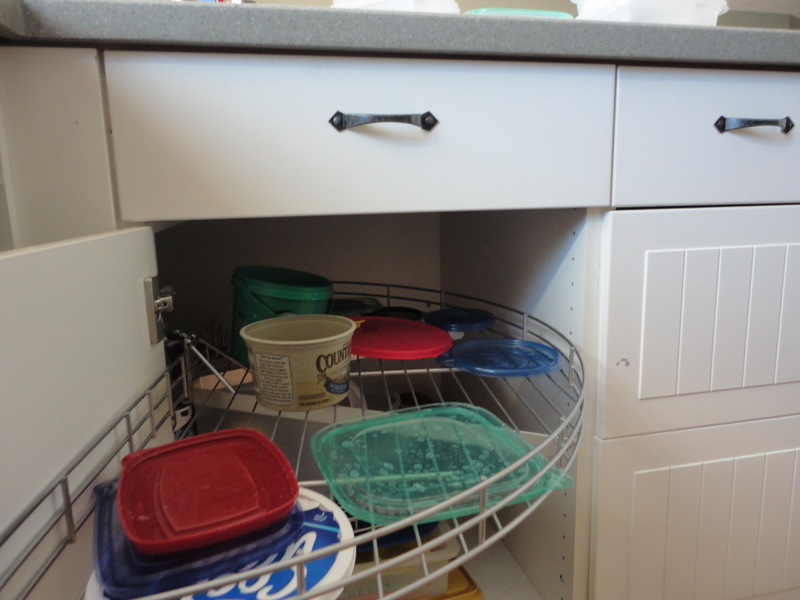 ), which is a corner cabinet by the way, and it was nearly bare. How could that be I asked myself? I had stocked up the container cabinet over the summer and I thought there were plenty of containers to get us through the holidays without having to spend money on new ones. But lo and behold we were down to practically nothing. Right after Thanksgiving I discovered what had happened. But before I tell you where all of the plastic disappeared to let me give you some background information. Since my newly found “Domestic Goddess” status was acquired earlier this year I have been a cooking fool. I love trying new recipes and making homemade meals for my family every night of the week. Now, in case you don’t remember Travel Man and are currently residing with our three college kids. Presently they all work during the day and are going to school at night. And then there’s Travel Man who on any given week is either away on travel or at home. So what this does to my menu plan is creates a little chaos, but normally leaves enough leftovers for the next days’ lunches for the college kids who are working. Sometimes they hide the leftovers on each other if there is not enough for all three of them (Ha! – I stay out of this situation). What do they use to take the nightly leftovers for their lunches, you might ask? Why, my plastic storage containers of course. So, if you picture a nice big corner cabinet with two racks that can rotate out of the cabinet, and they’re filled with storage containers in a perfect world. You know, you have all of the right sizes, and the perfect lids to match each size container. Ah, that would be so nice. But the reality is someone is always looking for a lid to cover their leftovers or just for a container to put the leftovers in. This past week the cabinet inventory in the plastic storage department was mysteriously replenished. How did this happen you might ask? Because I did ask three certain college age kids who shall remain nameless today, where the containers reappeared from. The answer to the disappearance of the plastic was that it had piled up in cars, work lockers, and work refrigerators. Now, the plastic has come home again. Which is a good thing because I refused to buy any new containers until I got to the bottom of this. For the moment it appears that my cabinet is restocked for Christmas time, and we’ll have enough plastic to last until the New Year rolls around. Wish us luck and keep a look out for your own plastic inventory here, there and everywhere. For you Mom – I always have ziploc bags! !